1.Please keep the luminous surface of the desk lamp clean, so as not to affect the lighting effects; If the surface of the light emitting surface is dusty, please use soft cloth to wipe dust. 2.Be sure to cut off the power before cleaning the LED desk lamp. 3.Do not place the desk lamp in unstable, flammable and humid places. The desk lamp enjoys 45 days Money Back Guarantee and 12 Months Warranty. Purchase with worry free. Choose Your Ideal Lighting Mode: There are 4 color temperatures that can be used for work, study, reading, or relaxing. Also, 5 levels of brightness can be chose for different needs. Multi-Functions: This LED desk lamp provides you multiple choice for lighting to meet your needs. Besides, it can be used as a charger with built-in USB output. Modern Simple Design: The modern appearance will naturally fits with any type of décor, including office or bedroom. Also, with its adjustable design, the lamp can be folded for easy storage. Friendly for Your Eyes: With durable metal alloy lamp arm and well-balanced lamp base, the table lamp provides a flicker-free lighting, which is eye-caring. Energy-Saving: Compared to the traditional incandescent light bulbs, this desk lamp will save up to 75% of energy when setting the same level of illumination. Multiple Brightness & Lighting Mode -- Provides 5 levels of brightness and 4 different light temperatures; offers lots of lighting options for your different lighting needs. Such as work, study, reading, or relaxing. Convenient USB Charging -- With built-in 5V/1A USB output, the desk lamp is able to recharge your smartphone or other device by keeping it within reach. It is convenient for you to be used as a charger for urgent charging. Adjustable Design -- The lamp head can be rotated up to 110 degree, the lamp neck can be swiveled by 130 degree, and the lamp arm can be adjusted up to 90 degree. It can illuminate the right place for your needs. 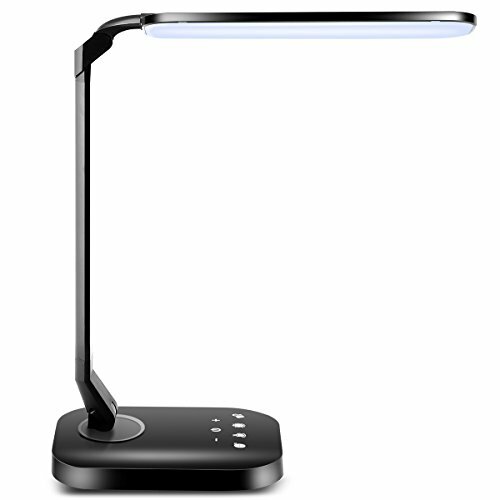 Touch Controls & Memory Function -- Equipped with touch-sensitive button, the desk lamp can be simply operated by touch controls; Its memory function means it is able to remember the brightness and color temperature last used. Eye-caring & Durable -- Made of high-quality material, the desk lamp is durable for years of use. With well balanced lamp base, it can provide steady and no-flickering light, which is friendly for your eyes.